Do you need a carrier for your toddler? Big kid stroller – what is it and why would parents need it? What is the best lightweight stroller for travel with baby? Nutrition for toddlers. What can 1-year-old child eat? As a parent of twins I know that choosing a double stroller may be twice as hard as picking a single stroller. It’s really difficult to find a stroller that is well-equipped, safe and strong enough to hold two kids securely, without being gigantic and excessively heavy. You will be going to the mall and running daily errands with it, right? So it should make your life easier, not harder. Whether you have twins or two kids of different age, I’m here to help you choose the right double buggy that will meet your needs. 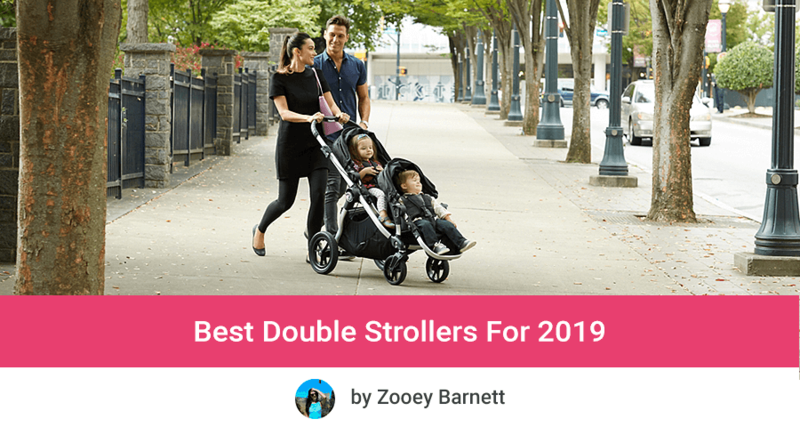 I present you my ranking of 9 best double strollers of 2019, which I can truly recommend to any parent. I chose only the reliable models that are highly rated by dozens of customers. My list includes only the highest quality and top-rated double strollers that have lots of versatile features, provide safe ride for two kids and are convenient to use for parents. 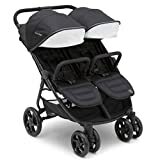 This is one of two great side-by-side strollers from Baby Jogger in my ranking of the best double strollers for 2019. Compared to regular City Mini Double, this model has few more versatile features but it is also more pricey. It has two regular seats that are suitable for infants who can hold their heads up (around 3-6 months). Each seat can accommodate a baby up to 50 lbs. There is multi-position recline with near-flat position. The seats have vented tops which provide additional ventilation. There are also retractable covers that you can use to close the vents. The whole seats and the calf rests are nicely padded to provide maximum comfort for the little passengers. Each seat has also a small, unadjustable footrest. I like that the seats are separated so one baby doesn’t disturb the other one during a nap. Very useful feature for parents who have an infant who often sleeps during stroll and a curious toddler. There are two, separately adjustable 3-panneled canopies. I love how far they extend to protect babies from sun rays and wind. Each sunshade has two peek a boo windows so you could keep an eye on your precious cargo. This double baby stroller has 8.5″ all-terrain wheels with rubberized tires. There is also front wheel suspension that soaks up bumps and smoothes the ride. Therefore it can handle gravel paths and slightly uneven terrain. Baby Jogger City Mini GT can be also turned into a travel system for one infant. So you can use this double stroller with infant car seat and toddler seat if you have two kids of different age or you can use two regular seat for infants who can sit unassisted or for two toddlers. Under the seats there is big storage basket, however it’s not easily accessible, because of the bar in the middle. Although the large diaper bag could easily fit in this bin, you are going to struggle to put it in and out. There are also storage pockets on the back of each seat, where parents can keep their essentials within reach. You can also fit there a bottle of water. I like that this side-by-side baby stroller has adjustable handlebar so pushing is comfortable for parents of all heights. It has also hand-operated parking brake (not foot-operated like regular City Select Double). The toggle is easy to use. Folding is super easy thanks to patented technology. 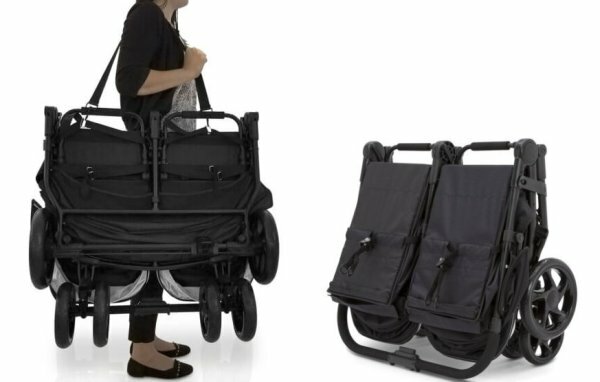 It’s hard to believe but you can actually fold this double stroller with one hand. Automatic lock keeps the stroller closed which simplifies storage and transport. Folded City Mini GT Double takes a lot of space – like any other double stroller. But it should fit in most car trunk without any problems thanks to flat fold (folded dimensions are: 30.12 x 30.12 x 11.22 inches). This model is a bit heavier than regular City Mini Double. It weighs 32.6 lbs. If you want to learn more about Baby Jogger City Mini GT Double here is my full review of this stroller. This stroller is pricey, so you should also check available discounts and compare prices of different color versions (there may be over $100 difference between some colors!). You can do it by clicking here. I checked what other parents wrote about this stroller at Amazon to find out if it’s worth the money. At the time of writing this ranking most reviews were positive. In the table below you can see major assets and drawbacks that parents mention. Although this stroller has suspension built into the front wheels and can handle many types of terrain, it’s not suitable for very rough terrain. On bumpy rocks kids will bounce a bit. 1. Many parent use it occasionally for older kids (even 5 year old), so it can serve as stroller for big kids or older toddlers. 2. 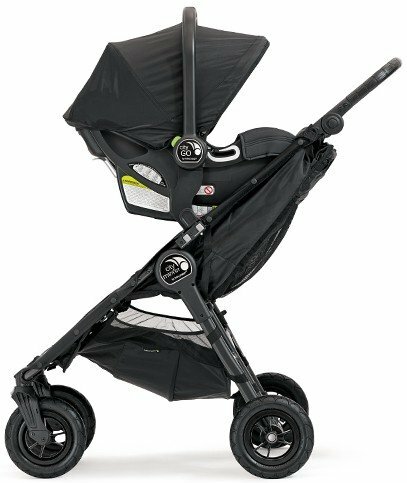 Thanks to high-quality, durable materials you can be sure this stroller is a long-term investment. 3. Works not only for twins but also as a double buggy for toddler and baby thanks to well-balanced construction. 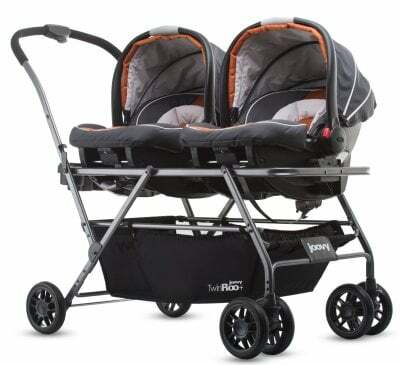 This is more expensive side-by-side double stroller, but the quality and versatility are definitely worth the money. Bumbleride Indie Twin accepts two infant car seats and two bassinets so parents can use it from birth. It’s not only a top-notch twin stroller, but also a great double stroller for siblings. All thanks to excellent stability and weight distribution. The regular seats feature near-flat recline, there are also adjustable calf rests.You can actually use the full recline and calf rest raised all the way up to convert the seat into infant-mode. It provides secured and enclosed space for small infant. It can be even used for a newborn baby but since the seat is facing front, you wouldn’t be able to observe your baby (except for the viewing window on the canopy). That’s why I think getting a bassinet for newborn baby is better option, particularly for frequent walks. But it’s nice to have a newborn-ready seat, especially since this double stroller is quite pricey and not all parents may have extra budget for the carrycots. The maximum weight capacity is 45 lbs for each seat. 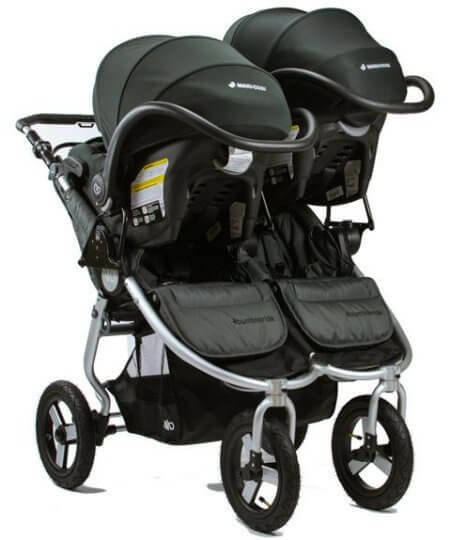 Based on customer reviews I can tell you that Bumbleride Indie Twin Double Stroller will most certainly serve you up to 3-3.5 years. I love how well-padded and cushy the seats are. They are perfect for naps on-the-go, no matter how old your babies are. Another noteworthy features are the two large canopies that extend really far. They even pass over the bumper bars! Even when the seat is fully reclined the canopy provides great amount of shade. Thanks to that you can be sure that the sun won’t disturb your kiddo’s nap. No more worries about sun in baby’s eyes! 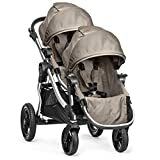 PRO TIP: I recommend you getting the latest version – this Bumbleride Indie Twin Double Stroller – which has redesigned canopies that provide more headroom and sun coverage. Each canopy has also a mesh peek-a-boo window with magnetic closure. It’s a huge advantage, because it provides additional air-flow and it’s silent, in contrast to Velcro which most parents hates. As I briefly mentioned at the beginning, this top-rated double stroller can hold two infant car seats at the same time. It’s a really rare feature – most side-by-side double strollers allow to attach only one infant car seat. Big plus for Bumbleride Indie Twin for this function. The stroller is compatible with Maxi-Cosi, Nuna Pipa and Cybex Aton models (you can find the full list here). If you plan on going for long-distance strolls from birth, I recommend you adding a bassinet for the newborn baby. Bumbleride Indie Twin allow you to attach two bassinet therefore you can actually convert this stroller into parent-facing double pram. As you can see all the seating options make this double stroller perfect for newborn twins, two toddlers or kids with small age difference. 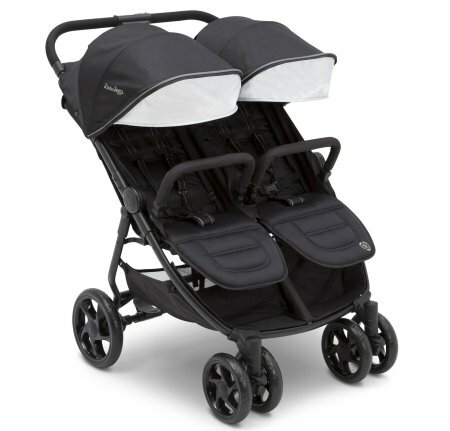 But the versatile seating configurations are not the only thing that make this one of the best double strollers. Bumbleride Indie Twin has fantastic all-terrain wheels that give you the freedom to go for a stroll wherever you want to! The wheels are big (12″) and have air-filled tires. There is also all-wheel suspension. These two features make the ride really cushioned, even when you’re going over harsh terrain. You’re going to love how smoothly this stroller handles sidewalks, trails, gravel, grass, even the snow. 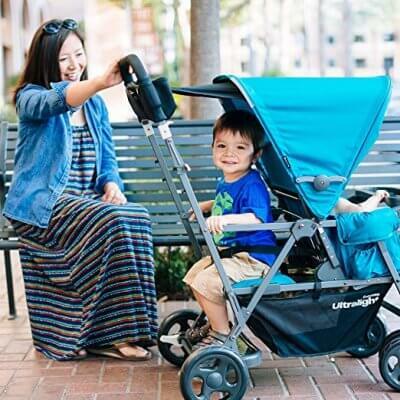 Thanks to Bumbleride Indie Twin you can forget about wobbling and shaking strollers. No more worries about disturbing your little one’s nap when going over some bumps. PRO TIP: Front wheels swivel, but you can also lock them when you’re on more challenging terrain or going at higher pace. This stroller isn’t light (36 lbs) but it’s a tradeoff for all these amazing features. Still this stroller is a breeze to push and operates seamlessly. So if you’re looking for a double stroller that handles different types of terrain and steers with one hand, even with two toddlers in it, Bumbleride Indie Twin is perfect choice. You will also love its large cargo basket that can easily accommodate large diaper bag. And the best thing is that this bin offers the easiest access ever, because there is no bar in the middle of it, like in many other double strollers. 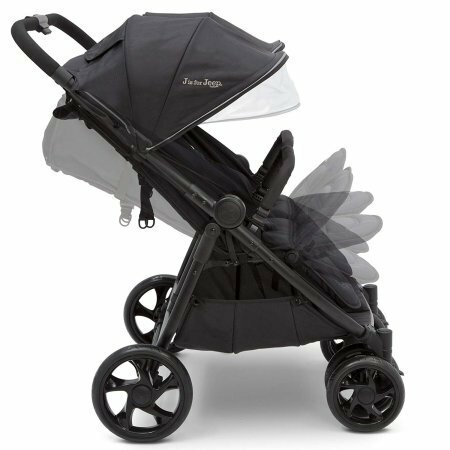 Bumbleride Indie Twin has additional large mesh pockets on the back and inside of each seat. 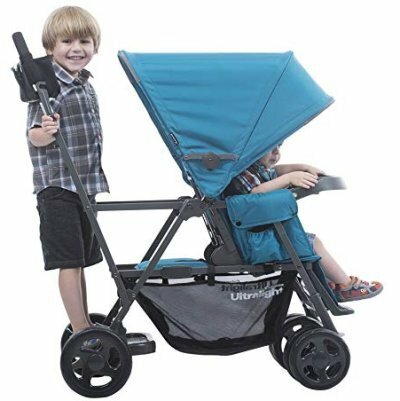 Are you worrying that as a double stroller Bumbleride Indie Twin may be hard to fold? That’s not the case with this model! It has one-step fold that takes literally few seconds. You just need to lift two triggers (one on each side on the handlebar) and fold the stroller forward. As a side-by-side double stroller, Indie Twin is quite big even when folded and may not fit in a small car trunk (it’s about 32.5″ x 29.5″ x 13.5″). On a positive note, there is auto-lock and self-stand which simplifies folding and storing. I’m sure you’ll appreciate these features. 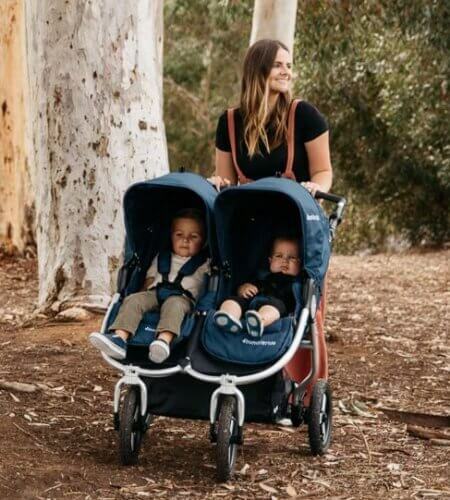 This double stroller is quite expensive and the newest model hasn’t been on the market very long, therefore the number of customer reviews is not very impressive, but one thing is certain: parents love Bumbleride Indie Twin! There are not so many customer reviews at Amazon, therefore I also checked the opinion on Bumbleride website. Below you can see what features parents praise most often and the drawbacks they mention. Except for the tire pump, accessories are not included. If you want a parents organizer, rain cover, bassinet, car seat adapters or standing board, you will need to spend some extra money. 1. With infant-ready seats and dual car seat and bassinet compatibility this may be the only stroller you will ever need. You will be able to enjoy it for about 3-3.5 years. 2. It’s versatile and truly all-terrain. With Bumbleride Indie Twin cracked sidewalks, grass, gravel or snow won’t be a problem! 3. All fabrics are eco-friendly and easy to clean. The seat padding + canopies are removable and washable. This model is highly-rated by parents and has plenty useful features which make it one of the best double side-by-side strollers available on the market in 2019. It has dual front wheel design with suspension that cushions the ride over bumps and harsher terrain. Front wheels swivel and can be locked for long-distance strolls. I’ve read in customer reviews at Amazon that parents use this stroller on grass and cracked pavement without any problems. The maximum weight capacity of this stroller is 100 lbs. Both seats have comfortable padding and recline to near-flat position. Each back rest can be adjusted separately and has vented top which provides extra air-flow – perfect for warm summer days. On colder days you can close it with a retractable weather shields. Calf rest is also padded with the same fabric as the seat. There is also a footrest – separate for each seat. I like that the seats are so roomy and have long back rests. Many parents uses this stroller even for 4-year-old kids. There’s one more thing that I like about the seats. They are nicely separated – which is especially useful when you have two kids of different age and one often naps during the stroll while the other sits upright and watches surrounding. Younger baby can sleep without being disturbed by older sibling. 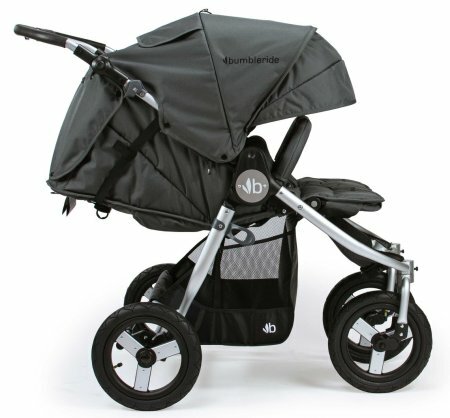 Baby Jogger City Mini Double has two individually extendable canopies. I love how much cover they provide for kids. Each sunshade has not one, but two peek-a-boo windows so you can always check on your little passengers during the stroll. I like that the handlebar has rubberized rings, not a foam cover which usually rips quickly. I only wish it was adjustable for parents of different heights. According to many parents this double stroller can be pushed with one hand almost effortlessly. Even with 3 or 4-year-old kids in it, you won’t feel the weight and the whole stroller will glide smoothly. Now let’s talk about the storage space. As for a double stroller is has only decent storage basket under the seats. You should be able to fit there a medium-sized diaper bag. There is one thing about this bin, that parents really don’t like – it’s not easy accessible. There is a bar in the middle, behind the basket that blocks the access, therefore putting bigger stuff in and out of it is quite difficult. Moreover, when both seats are fully reclined it’s even more difficult to take something out of the basket. Good thing is that the sides are elastic which allow to put small items in and out more easily. Fortunately this stroller has two additional storage pockets – one on the back of each seat. You can put there your essentials like phone, wallet, keys or a small bottle of water. When I was getting my first double stroller I was afraid that folding it would be a nightmare. With Baby Jogger City Mini Double you don’t have to worry about folding at all! Thanks to patented technology this stroller closes easily within few second. And thanks to compact, flat fold (31.89 x 30.12 x 9.84 inches) it fits in majority of car trunks. Many parents also worry about getting through doorways and elevators with double strollers. This model is not much wider than a single strollers! It is about 30″ wide so you won’t have any problems with fitting through normal doorways. 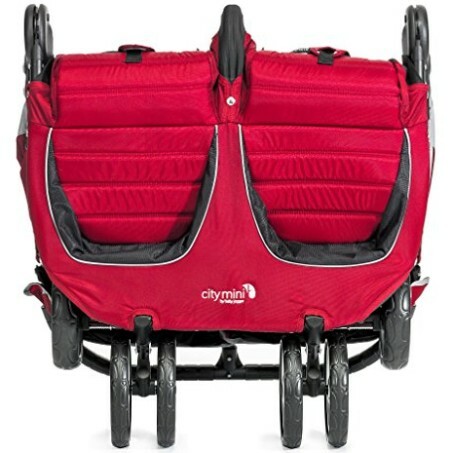 Baby Jogger City Mini Double weighs 28.6 lbs which is not so bad as for a double stroller. Lifting it to the car trunk is definitely doable, even for a petite women (like me). I checked customer reviews at Amazon and I have to admit that this model is really highly rated. It has almost only positive reviews (you can check how many opinions it has here). This stroller has 8″ foam rubber tires which can handle uneven ground, but they are definitely not all-terrain. City Mini Double is also not suitable for running. 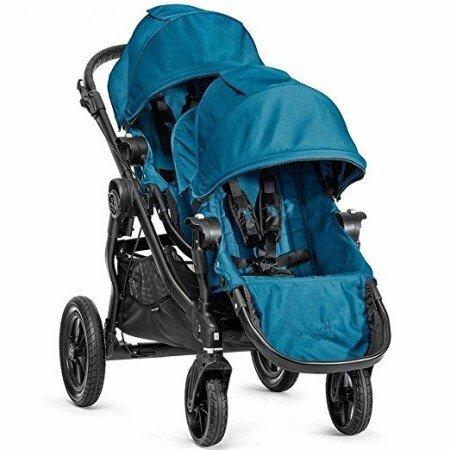 If you are looking for a twin jogger, here you can find my list of the best double running strollers. 1. This is one of the best double strollers for toddlers. And since it can accommodate one infant car seat it can be also used as a double buggy for toddler and baby. 2. It’s light and compact enough to be convenient to use for parents and comfortable enough for day trips. Many parents recommend it as main and only stroller. 3. Thanks to roomy seats it can be used for older and taller toddlers. This is a medium price range stroller, but last time I checked it at Amazon some color versions were even cheaper. I’m not sure if this offer is still available, but you can check it on your own by clicking here. This is probably the most popular and best-selling double side-by-side stroller. It’s very well equipped and in addition it’s a low budget option. Each seat can accommodate a passenger from 3 months up to 45 pounds. You can adjust the seat backs and calf rests individually. The one-hand infinite reline allows you to set the back rest in any position. The seats go to near-flat position which is perfect for napping on the go. There is also removable bumper bar for both seats. There is however one canopy for both seats. I’m not a fan of this design, I definitely prefer two separately extendable sunshades which are useful when one baby wants to nap and the other wants to observe everything around. Joovy Scooter X2 canopy is roomy but doesn’t extend very far down. It covers babies faces and torsos, but definitely not their legs. The handlebar is unadjustable and has fixed height – 41.75 inches from the ground. Some parents complain the grip is short and wish it was extendable. This double stroller has rather small wheels (9.5″ in the back and 7″ in the front), made of durable rubber. Dual front wheel design creates a strong foundation and adds stability. Front wheels are pivoting and lockable. There is one-step linked parking brake. Bearings on the wheels provides better maneuverability and the built-in suspension on each wheel gives impact resistance and allows the stroller to handle many types of terrain: pavement, gravel, cobbled streets, dirt trails. It’s not great for sandy beaches though. As for an everyday stroller it’s still very impressive. Although this is a double stroller it’s very nimble and its maneuverability is incredible. However remember it’s not designed for running. I like how big storage space this stroller offers. There is capacious basket under the seats where parents can easily fit their diaper bag and few other stuff. There are two additional zippered pockets for your valuables and two beverage holders on the back of each seat. This integrated organizer is very useful and parents don’t have to spend extra money on a console or another organizer to keep their essentials at hand. With Joovy Scooter X2 Double Stroller you don’t have to worry about getting through doorways – it’s only 30″ wide so it easily fits through standard doors. This side-by-side stroller isn’t very light – it weighs 32 lbs and some parents find putting it in and out of the car trunk quite challenging. Good thing is that it folds compactly and fits in most trunks (folded dimensions are: 35.5 x 30 x 13 inches). 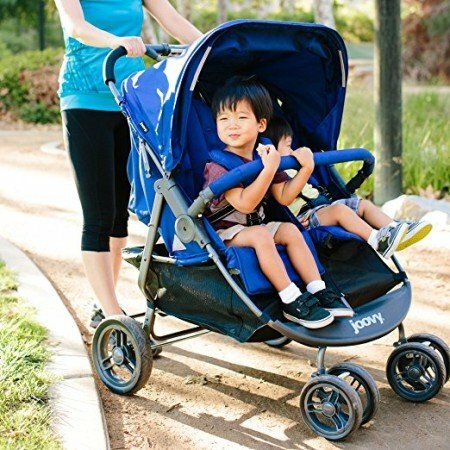 Joovy Scooter X2 Double Stroller comes in 5 different colors. Keep in mind that the availability and price may vary, depending on the color version you choose. You can compare prices of all colors here. I always check customer reviews at Amazon before I decide to buy a product for my babies and this stroller was no exception. At the time of writing this review it has over five hundreds reviews (and most of them are positive ones). It’s a remarkable result! Although this stroller can handle many types of terrain I wouldn’t recommend it for grass and sand. Going over snow and mud may be also challenging. Also, this model is not compatible with infant car seats so it cannot be used for newborns. It’s a stroller for two kids at least 3 months old. 1. It’s well equipped and convenient to use like the most luxury strollers, but much cheaper. 2. Perfect option for parents on a small budget. 3. 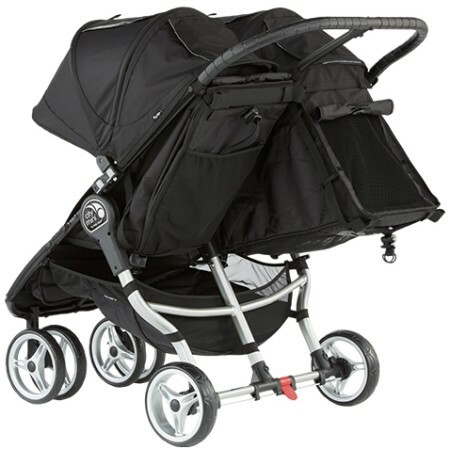 Great stroller for everyday use, shopping, running errands and day trips. 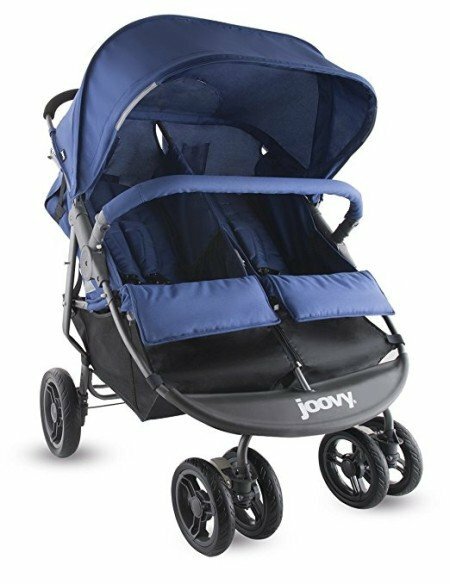 To get this stroller at good price with full warranty you should purchase it from seller approved by Joovy. On the official website manufacturer recommends Amazon as trusted and official source. Click here to check latest price. This is one of the best tandem double strollers. Although it is a high price range model, it has been very popular among parents of twins and kids of similar age. At the beginning I have to say this is a convertible and expandable stroller which means that parents can use it as a single or double stroller, however it has the same size in both modes. Moreover, you can buy it as a single stroller and add the second seat later (perfect solution for parents who have one child, but plan on having the second one soon) or you can buy the whole set with two seats. Are you thinking about buying expandable stroller? There are few other great models that I can recommend you: UPPAbaby VISTA, Bugaboo Donkey and Baby Jogger City Select LUX. Baby Jogger City Select Double can be used with one or two infant car seats, bassinets and regular toddlers seats and you can mix different seats if you have kids of different age. Altogether there are 16 different seating combinations (for double version) so you will be always able to find the right option for your little ones. As you can see this tandem double stroller grows with the baby and adjusts to growing family needs. Of course bassinets and car seats are sold separately, nevertheless it is really good to have the ability to switch between different seat as the babies grow and have all-in-one stroller. Now let’s see what other feature Baby Jogger City Select Double has. The regular seats are suitable from 6 months up to 45 lbs (usually they are sufficient for 3-year-old kids). Each seat reclines individually and has 4 different position. Calf rest is adjustable as well. Moreover the seats are reversible, so kids can face you or the World. You can also this double stroller with seats facing each other which is so much fun for the kids. Individually extendable canopies provide nice shade and can be also adjusted for different head heights. Each canopy has peek-a-boo window with silent magnetic closure so you could check on your little passenger at any time you want. Canopies are made of fabric with UV50+ protection. I love the handlebar on this tandem stroller. It is extendable, so parents can find the most comfortable height for them. Thanks to telescoping push bar tall parents have more space behind the stroller and don’t kick the back of it while walking. Big plus for Baby Jogger City Select for this feature. There is also a hand-operated parking brake. Front wheels are 8″ and can be pivoting or locked. The rear ones are 12″. The wheels are rubberized so you don’t have to worry about punctures or inflating the tires, but you can still enjoy strolling over many types of terrain, including the more difficult ones. But keep in mind that this is an urban stroller and it works best on flat surfaces: pavement, sidewalks, asphalt, even gravel paths. It will handle bumpy ground as well, but may wobble a bit. As for such a big stroller it folds up really easily and quickly and what’s the most important – it doesn’t take up so much space when closed. You’ll be surprised how compact folded City Select Double is. There’s one more important thing: color versions have different prices (there’s even up to $100 difference!). Before you decide to buy this stroller make sure to compare price of all colors – you can do it here. This stroller is pricey so I had to check other customers reviews at Amazon to find out if it’s worth the money. And according to dozens of parents it is! This stroller is highly rated and very popular, despite its high price. If you want to check the customer reviews on your own – skip to Amazon. As any other convertible stroller it is rather big in single mode, but quite compact in double version. However with two seats attached the stroller gets more heavy – it weighs almost 38 lbs. And since the seats are close to each other older toddlers may have less space for each other. 1. 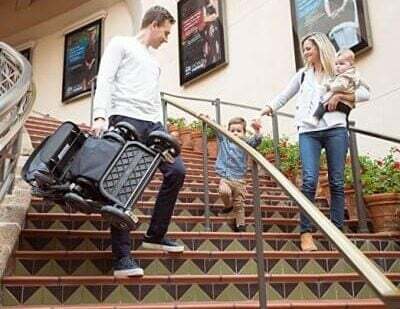 This stroller gives you over 16 different seating options as it grows with the baby and the whole family. 2. It can hold two infant car seats so you can use it since birth as a double stroller for newborn twins. 3. With its enormous storage basket you will always have enough space for all your stuff even for a day trip. This model is fairly new on the market, but it quickly gets more and more popular. There are no bells and whistles, but it has all the necessary features, weighs only 21 lbs and in addition, it’s a low-budget option! Destination Ultralight Double Stroller by J is for Jeep Brand can be used from 6 months (or when the baby has developed neck control), all the way up to 40 pounds per seat. Each seat feature independent, multi-position recline. Frankly, it’s not the deepest recline I’ve seen, but it’s sufficient for a comfortable nap. You can also flip up the calf rest to give your baby’s little legs more support during the naptime. Since there is no flat recline, nor car seat/bassinet compatibility, this double stroller is not suitable for newborn twins. However it serves amazingly as a second, lightweight double stroller. If you need a buggy for everyday use in the city for your 6 month + kiddos and you’re on a tight budget, you should definitely consider this top-rated double stroller. The seat interior is nicely padded and feels really cushy. I only wish the harness straps were padded too, to be more gentle for baby’s skin. It’s something you should keep in mind. On a positive note, there is a separate bumper bar for each seat, included with the stroller. The bars are removable and swivel to make taking baby in and out of the seat easier. Nice! Another useful feature is the water resistant fabric. 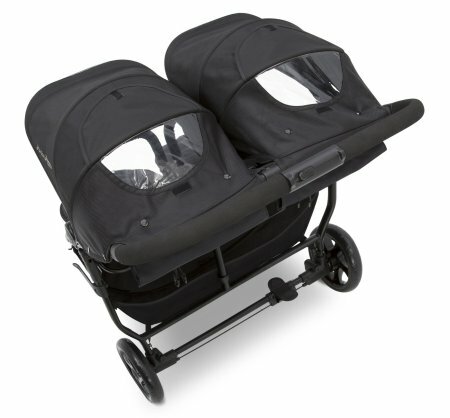 This double baby stroller has individually extendable canopies with SPF 50+ pop out sun visors. They are not as generous as the canopies on Bumbleride Indie Twin or Baby Jogger City Mini GT Double, but still big enough to keep the sun out of baby’s eyes. For parents’ convenience each canopy is equipped with plastic viewing window. They have good size and allow you to peek at your little riders during the stroll. I would prefer magnets instead of Velcro for closing though. Now let’s take a quick look at the wheels. Front dual wheels are 7″ and they can be locked for greater stability on uneven terrain or unlocked for added maneuverability. The rear wheels are 10″ and have suspension that cushions the ride. This is not an all-terrain double stroller, but it operates pretty well on surfaces like gravel paths and short grass (and of course pavement). J is for Jeep Brand Double Stroller is not as versatile as for example Indie Twin, but it won’t let you down as a city stroller. IMPORTANT: I’ve read in customer reviews that some parents have run with this stroller. Remember that it’s not designed for jogging and it’s not safe to run with it! The storage basket underneath the seats is quite impressive and can hold a lot of stuff. However, typically for a double stroller, on the back of it there is a bar in the middle. It makes the access to the bin a little harder, but not fully blocked. I like that this double baby stroller folds up easily, locks automatically and stands on its own when folded. It collapses in half and you can carry it on your shoulder thanks to included carrying strap and lightweight construction. 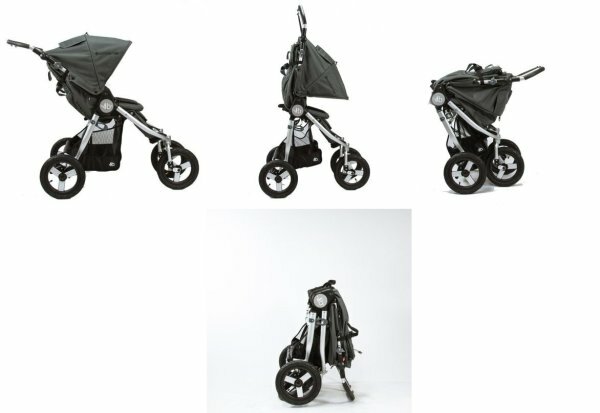 The dimensions of folded stroller are: 29.5″ x 30″ x 13.4″. Since it weighs only 21 lbs you’ll be able to load it in the car trunk effortlessly, but it will definitely take up a lot of space. This side-by-side double stroller lacks some features like car seat compatibility, near-flat recline or adjustable handlebar. But it’s ultra-light, handles different types of terrain, navigates easily and costs less than $300. How could you not fall in love with it!? 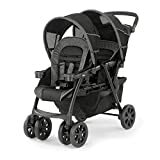 I checked customer reviews at Amazon and I have to admit – the amount of compliments this stroller receives is really impressive. It’s one of the top-rated double strollers. See the current rating for yourself (click). This stroller is not suitable from birth – the seats don’t recline far enough, there is no options or attaching infant car seat or bassinet. You can use it only for kids who have neck control. 1. It’s lighter than many standard single strollers! No more struggles with carrying or loading the stroller to the car trunk. 2. This is one of the cheapest double strollers, perfect options for parent who have to stick to their budget. 3. It’s a dream to push and navigate – perfect for travel and everyday use like shopping trips, going to the day care and long walks. One of the top-rated strollers for siblings in 2019, the Joovy Caboose is practically a double only that it is meant for an infant and an older kid, say 2-year-old and up. 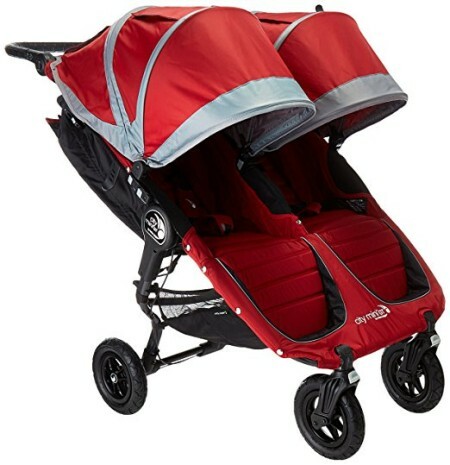 This is a highly functional and cheap double buggy that comes in 5 color schemes with no variations in price. Generally speaking, this is not an expensive double stroller. If you’re on a tight budget, it’s definitely worth consideration. 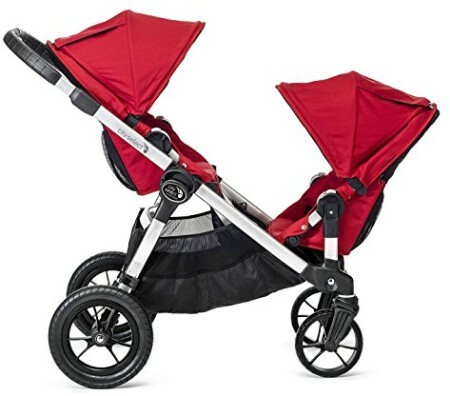 But what makes the Joovy Caboose Ultralight one of the best double strollers for this year? I would say versatility, ease of use and lightweight design. The first thing that I liked about this stroller is that it is meant to come in handy right from your child’s birth in that it can be used as a travel system. While it does not come with a car seat in the package, it has a universal car seat adapter that accepts seats from most brands. This stroller’s front seat unit can accommodate 3+ months old infants and has a weight capacity of 45 pounds. This seat has 3 recline positions that you adjust using one hand. Although it does not recline completely flat for napping, it still has enough give for a quick rest. Another feature worth of mention here is a footrest that adjusts all the way up to boost the overall comfort of the baby. The seat at the back is basically a bench recommended from 6 months, up to 45 pounds too. It’s equipped with 3-point harness to keep the big boy or girl securely in place. There’s an option to add the Caboose Rear Seat to convert the bench into a full-size, front-facing seat, which looks exactly like the front one. It’s sold separately, but it doesn’t cost much (check it here). PRO TIP: If you already know you want this stroller with standard rear seat, choose this Joovy Caboose Too Ultralight with second seat included. It’s cheaper than purchasing stroller and second seat separately. The bench seat has a really thoughtful design that allows it to slide front and back to allow the older kid to access it when the front seat is reclined in the 2nd position. However, it will be impossible to sit on the bench if the passenger at the front wants the seat almost flat or if you are using a car seat. But that’s where the stand-on platform comes in. What your older kid will love about this platform is that they can use it while facing either forward or backward. Moreover, this standing platform doubles as a footrest when the older child is sitting on the bench seat. The front seat’s sunshade is decent, but it doesn’t extend very far so it may not always fully protect the baby from sun. 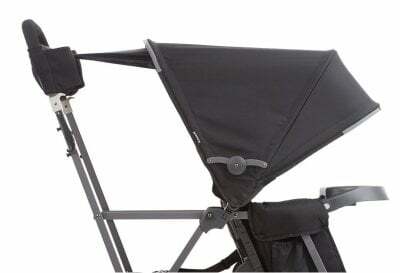 There is also a rear canopy attachment to protect your kid at the back from the sun. It’s not a full-sized canopy, rather a small hood that reminds me a bit of GB Pockit sun hood, but it’s still nice addition. In regards to maneuverability, the Joovy Caboose Ultralight is really easy to push and can fit in standard doorways thanks to its narrow design. It’s an advantage of a tandem stroller over a side-by-side double stroller – it fits in tight narrow alleys and sidewalks. The wheels are made of soft rubber and while they are not meant for unbeaten paths, they have a suspension system that offers really smooth rides on flat pathways. Just as its name suggests, the Ultralight Sit and Stand double stroller is amazingly light at 23.5 pounds (with all the accessories on). Moreover, it’s a narrow double stroller. It measures about 21 inches in width. This means that it is just as narrow as a single stroller and it actually maneuvers like one only that it is a few inches longer which is quite practical for its design. Remember about its longer wheelbase, especially in tight corners. Folding it is a 3-step process and it requires using 2 hands because you need to pull up a release toggles on each side of the handlebar, then push it all the way down to fold. This is probably the biggest challenge that I found with this stroller, by the way, coupled with the fact that it does not lock automatically and self-stand. Oh, one more thing. Although this is one of the best double strollers for infant and toddler, it has annoyingly large fold. It measures 42.25 x 21.25 x 10 inches (L x W x H) when folded. It’s very long and feels quite bulky. It may not fit in a small car trunk, if you have a bigger car you probably won’t have problems with it. Unfortunately big fold is a common issue with double strollers, both tandem and side-by-side ones. The Ultralight Graphite is quite popular among parents if the reviews at Amazon and on the manufacturer’s site are anything to go by. Here are some of the common pros and cons that stood out from their feedback. 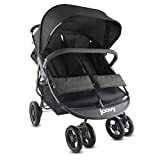 The ability of the Joovy Caboose Ultralight to withstand a weight of up to 90 pounds definitely ranks it as one of the best double strollers for 2019. However, the softer rubber wheels mean that it’s meant only for city rides and in paved parks. 1. Thanks to its slim construction it’s easy to maneuver and fits through doorways and elevator with ease. 2. It’s one of the lightest double strollers on the market which makes it easier to lift to the car trunk. 3. Bench seat and standing platform make it a great double stroller for an infant and a big kid. This is great convertible tandem stroller in medium price range. It has 4 seating combinations to accommodate twins and kids of different age. This tandem double stroller comes with two regular seat suitable for babies who can sit unassisted and up to 40 lbs (per seat). Parents can attach one or two KeyFit and KeyFit 30 infant car seats and it makes the stroller perfect for newborn twins. There is also option for children of different age – one can ride in an infant car seat (attached in the front or back) and the other one can ride in the regular seat. The seats recline to provide more comfortable napping, the rear one goes really low and creates perfect space for younger infant. I really like most upright position – it’s perfect for curious toddlers who want to observe everything around. There is also nice soft padding on the seats and harness. I only wish the canopies were bigger. They only cover top of the seat, but they don’t provide full protection from the sun and wind. Parents can also remove the sunshades and then the stroller can accommodate older kids. There is also interchangeable bumper bar and two cup holders for the kids. 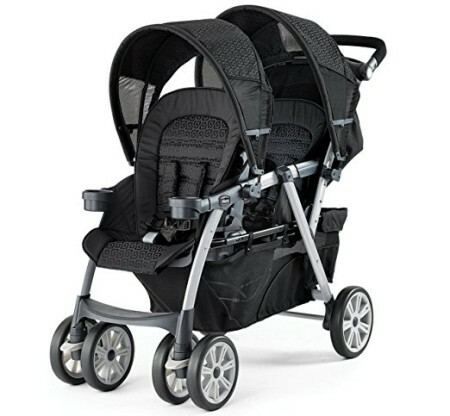 Chicco Cortina Together Double Stroller comes with parent tray as well. There are 2 cup holders and enclosed storage compartment. Under the seats there is enormous basket where parents can fit all of their essentials even for a day trip to the zoo or Disneyland. In other tandem models there is problem with accessibility, especially when the rear seat is reclined. In this stroller you always have easy access to your stuff because even when the rear seat is fully reclined, you can open the basket (there’s a zipper) and quickly take your necessities in or out. I like that this tandem stroller has adjustable handlebar with 3 height settings. Other tandem strollers in this ranking don’t have this feature. This buggy has also bigger wheels than other tandem models. Dual front wheels are 8.25″ and the rear wheels are 9.25″. They are made of hard, durable rubber. You don’t have to worry about punctures since the wheels are non-inflatable. 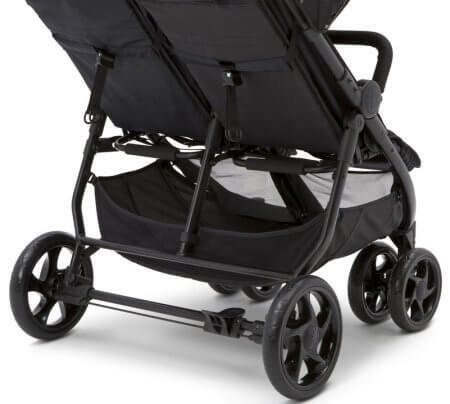 Fronts wheels swivel which makes the stroller easier to maneuver and turn, but they can be also locked for added stability during long-distance walks. I like that this stroller has all-wheel suspension. It’s still not all-terrain buggy, but it does absorb some shocks on a slightly uneven terrain. You don’t have to carry this stroller, you can pull it! This tandem double stroller also features one-hand fold and it also stands on its own when closed. Oh and there’s one more thing. The stroller weighs 34 lbs which makes it pretty difficult to carry, but you can pull it like a suitcase when it’s folded! Super useful feature. 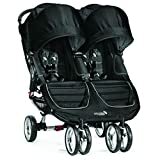 Chicco Cortina Together Double Stroller is quite popular at Amazon and has many positive reviews. I gathered the major advantages and drawbacks that other parents mention. This stroller is designed mainly for city use on flat, even surfaces. It can handle slightly rough terrain (like gravel), but on more difficult ground it bounces. 1. It has the most easily accessible storage basket of all tandem strollers. 2. Thanks to different seating options, it can be used from birth till toddlerhood for kids of the same of different age. 3. It’s really well-equipped (adjustable handlebar, children cup holders, parent trays, nicely padded seats) and still has pocket-friendly price. This is a low-budget alternative for double twin stroller. It’s just a frame that can accommodate two infant car seats. 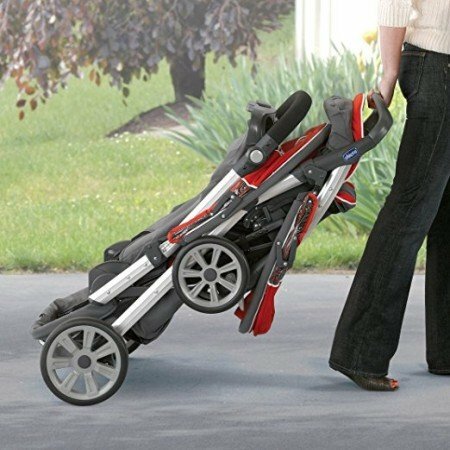 Perfect solution for parents on a small budget that don’t need full-sized stroller for their twins during first few months. When the infants are old enough parents can change the frame for a double lightweight stroller which is definitely more pocket friendly than a standard stroller. Let’s take a look at the feature that this double stroller frame has. It accepts major brand car seats. To attach the infant car seats you will need to purchase separate adapters. It’s an additional cost, but it’s still cheaper option than many standard double strollers. Currently there are adapters for these car seat brands: Britax, Chicco, Graco, Maxi Cosi, Cybex, Peg Perego and UPPAbaby. As you can see the choice is really vast, and you’ll be able to attach most of the popular car seats. Notice that this stroller frame is not compatible with any of Evenflo or Phil and Teds car seats. What’s unique about this double stroller frame is that it’s narrow as a single stroller, but the car seats are mounted side by side (facing the same or opposite direction). In the picture below you can see how it looks like. Most frames have car seats arranged in stadium-style seating where the second one is mounted behind the first one. 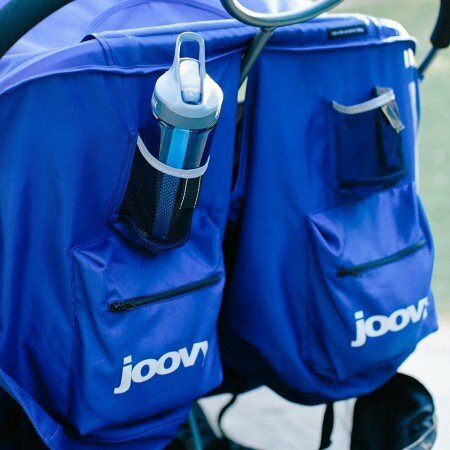 Joovy Twin Roo+ has different design, but frankly – it turns out to be really convenient! When the car seats are side-by-side you have a clear access to both of them and you can easily take your babies in and out. 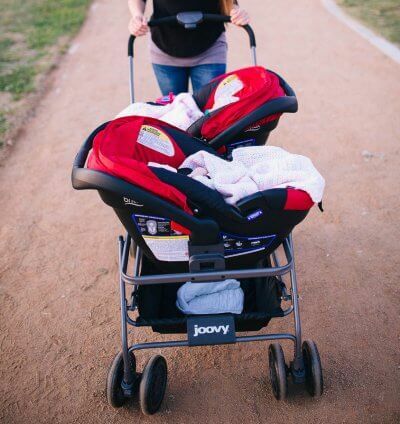 With Joovy Twin Roo+ you don’t have to worry about the handlebar or the second car seat getting in your way or blocking babies’ view. There is a large basket that can accommodate a lot of parents necessities. Just keep in mind it may be less accessible when the infant car seats are on. 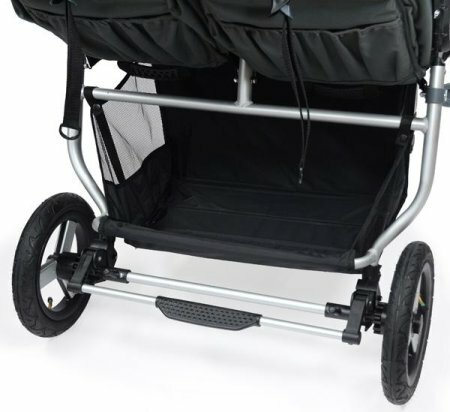 Joovy stroller frame is also equipped with useful parent tray mounted below the pushbar. There are FOUR beverage holders and a place for your phone. Each of the cup holder doubles as a storage compartments. This double car seat frame has dual swivel front wheels which make it more maneuverable. Keep in mind that you will probably need to operate it with two hands, especially in narrow places and corners because of its long wheelbase. The wheels are medium sized and non-inflatable therefore they are best for urban environments and hard, paved surfaces. Their performance on gravel driveway or paths in park is decent. But I don’t recommend it for unpaved roads and other bumpy surfaces, because it will wiggle and shake. Folding is easy and quick and you can wheel it up to your car trunk like a suitcase. The fold is really flat, but it’s very long (almost 48 inches), so it does take up a lot of space in a trunk. But it seems to be easier to store at home, if you place it on one side. I checked what other parents think about this frame and it turned out this solution is very popular among parents of twins. It’s highly rated and many parents recommend it for the first few months with infant twins. Here you can read customer reviews on your own. The frame requires adapters for attaching the car seats. If you purchase just the frame you won’t be able to use it. You need to add the adapters first, and unfortunately all adapters are sold separately. On a positive note, they cost less than $30 and even with this additional cost it’s still a cheap alternative for a stroller for twins. Also, remember that car seats are more suitable for short walks, not long-distances strolls. 1. It’s a great option for parents on a small budget, who don’t want to spend much money on a standard stroller. 2. Thanks to unique design you have easy access to both of your babies and their way is not blocked by anything therefore they can observe the World or interact with each other. 3. This frame is excellent stroller alternative for the first few months. When your babies outgrow the infant car seats, you can switch to a double umbrella stroller (which is also pocket-friendly). On the market there are two main types of double strollers: side-by-side and tandem models. In tandem version one baby sits behind the other one or the kids can be facing each other. In some models the back seat is placed a little bit higher that the front one. This version is called stadium seat. Thanks to that kind of seating option both kids can explore surrounding during a stroll. Tandem stroller has the same width as a single stroller, but it is much longer. It makes going through curbs much more difficult. There is also one more disadvantage of this type: when we recline the front seat, the kid in the back seat has smaller space for legs. In side-by-side stroller kids sit next to each other. This type is as long as a single strollers, but it is much wider. Nevertheless, I have never had any problems with going thru normal doorways or elevator. The width can be a problem when we are trying to fit into narrow grocery store alleys – it can be really difficult not to bump into any shelves or stands. However, I really like this type of double strollers, because I know seating next to each other is so much fun for the little passengers! Hello Moms! I am Zooey. I am a wife and a mother of three amazing kids: almost 5-year-old Haley and 2-year-old twins Jesse and Matthew. I am a jogger, cooker and blogger. Hi zooey! Im expecting twins and after a looot of research, ive narrowed it down to either: getting a snap n go fot the first months and then getting a city mini gt for when they’re older…i also found the Peg Perego duette piroet which looks awesome (have only seen it online, not in person) , its kind of like a snap n go but can hold 2 car seats, bassinets, or regular seats and you can switch them as they get older. It looks ideal but am not sure what to do! If you could look at the peg perego and tell me your opinion i would be soooo grateful!! Thanks! Hi Gabriella! Generally speaking car seat frame like the Snap ‘n Go is a great solution if you won’t be going on long walks (I don’t recommend car seats for long-distance walks) and if you have mostly flat terrain in your neighborhood. On the other hand Peg Perego Duette has better wheels so I think it would be more versatile and of course it is nice to have different seats and you can quickly switch between them. Just keep in mind that with two bassinets, this stroller would be really really long 🙂 It could be quite difficult to navigate it in a grocery store, but for strolls it should be okay. City Mini GT has even better wheels (all-terrain ones) and longer canopies (than the Duette Piroet) which nicely shade kiddos. Which one is best – it really depends on your preferences and what features are most important for you. 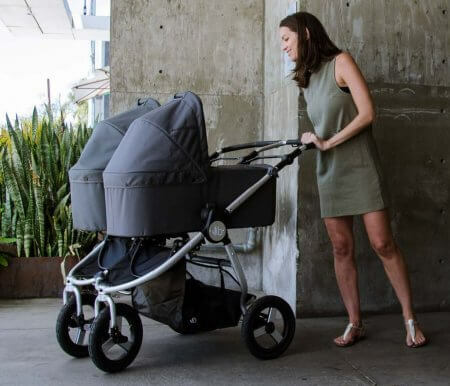 I would say for long walks, different types of terrain, summer months – City Mini GT, but if you want to have only one stroller that grows with your babies – Per Perego. 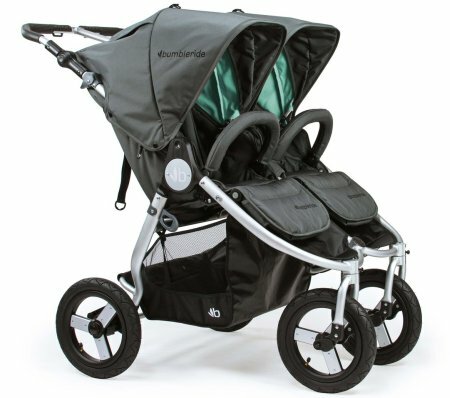 I have a 2 yo and 1 yo and looking for a double stroller that is lightweight and great for long walks. We are at Disney at least 2 times a week and though bringing my LUX is nice, the basket is too difficult to get in and out of and the seats are not great in the warm Florida heat. I need something that has great accessible storage, reclining seats for naps, and lightweight. Hi Jennie, sorry for late reply! Have you considered VISTA? It’s not ultra-lightweight, but lighter than City Select LUX (about 4 lbs) and the basket is gigantic and easy to access from the back. The seat recline really nice and the wheels and suspension are great for long-distance walks on multiple types of terrain. I find this stroller even more versatile than City Select LUX and perfect for kids of a similar age. Hi Zooey! I’m pregnant with twins (yay!) and am trying to figure out the best stroller options! 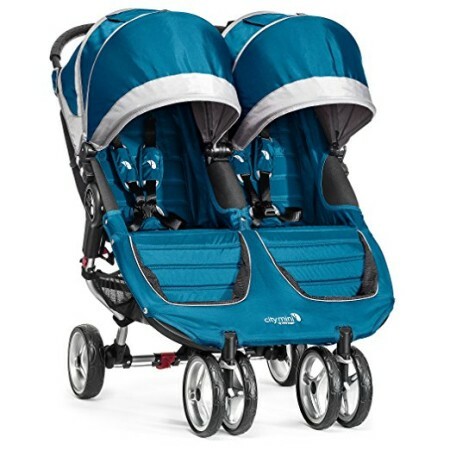 I love to run and be outside in general but don’t know if it’s best to get a couple strollers-one for exercise and outside and one to take to stores, etc? I also notice that most of the double strollers that are also joggers don’t have the capability of having two carseats. How did you get around this? Did you just wait until they were 6 months for the jogging stroller? You have also few options for the primary stroller. If you often go out or would like to take your babies for off-road stroll (it might be also a good exercise:)) I would recommend you these strollers: Mountain Buggy Duet or Baby Jogger City Mini GT Double. 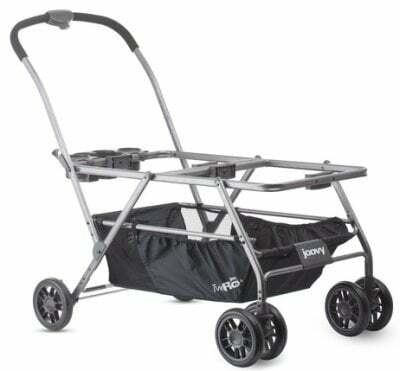 These are not jogging strollers but they have awesome wheels for tough terrain and you could use them with infant car seats or bassinets and then switch for toddler seats. I like these double strollers because they are pretty slim so it’s easy to get through doors or navigate them through shopping aisles. 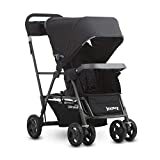 You can also check out this Baby Jogger City Select LUX which allows to add different seats (if you prefer tandem stroller rather than side-by-side one). I reviewed all of these strollers on my blog, feel free to check out my reviews. Let me know if you have more questions 🙂 take care! Hi Zooey- I see you recommended the Mountain Buggy Duet or Baby Jogger City Mini GT Double; do these strollers have the ability to hold two car seats? I thought the Mini GT could not support two at the same time. Thanks! Copyright © 2016 - 2019 Baby Stroller Reviews. All rights reserved. LittleBabyGear.com is a participant in the Amazon Services LLC Associates Program, an affiliate advertising program designed to provide a means for sites to earn advertising fees by advertising and linking to Amazon.com.